What is The Revolving Closet ? The Revolving Closet is a free boutique for young people ages 12-18. Open the FIRST and THIRD Sunday of every month to meet your needs all year long. North Country Cares is a program to help children ages 12-18 in the Mount Washington Valley and surrounding area. Anyone in need of assistance can leave a message on the website or contact a board member! What do you do other than The Revolving Closet? 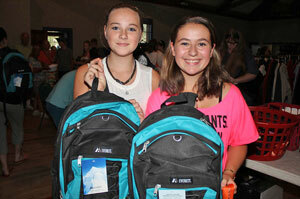 North Country Cares holds an annual “Back to School Giveaway” every August. This is an event to prepare valley children ages 12-18 for the school year. Clothing, backpacks, and school supplies are some of the items we give away. “Tis The season” is another annual event to help family during the holiday season filling stockings for 12-18 year olds. We also work closely with the foster care system, helping them whenever we can. NCC also works with local school systems providing needed support, food and necessary items. Is funding available for special needs? Yes, contact a board member or email for details.